China’s economic performance over the last few decades has been outstanding. Despite possessing very different institutions than those seen in the advanced economies, no doubt a result of its communist system, China managed to achieve 8.7% average annual per capita GDP growth from 1980 to 2015. The key has been its unique strategy of “crossing the river by feeling the stones,” whereby it has gradually tested, implemented, and adjusted reforms and growth-enhancing policies. But, while China’s economic development has been exceptional in many ways, its growth performance is not unique. Both Japan and South Korea also transformed their economies through rapid industrialization and export-oriented policies, backed by strong investment, before experiencing slowdowns. If China is to manage its current challenges – in particular, sharply decelerating growth – it should look to these countries’ experience for guidance. All three countries have followed a similar path, but at a different time. Based on per capita GDP, China is more than 40 years behind Japan and about 20 years behind South Korea. Specifically, Japan’s annual per capita GDP growth averaged 8.6% in the 1960s, before plummeting to 3-4% in the 1970s and 1980s. 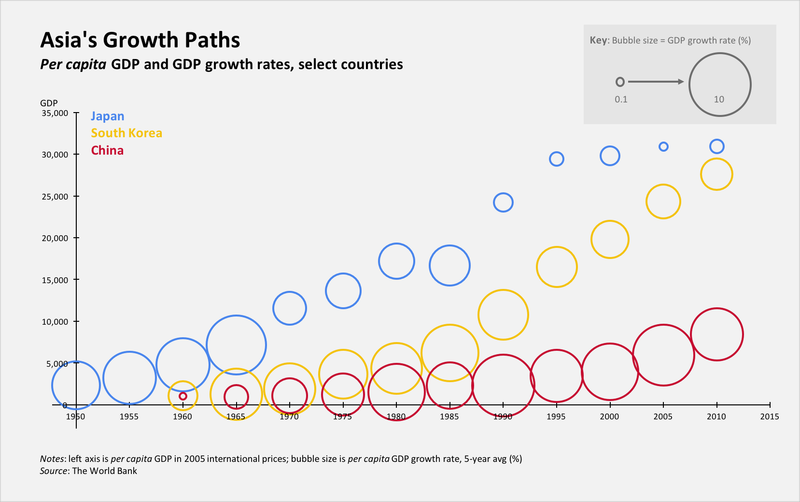 South Korea’s GDP growth dropped from 7-8% in the 1970s and 1980s to 4% in the 2000s. China’s three-decade-long run of double-digit growth came to an end in 2010, with the annual rate now below 7%. In each case, the decline in growth came when per capita income reached about $8,000. The growth trajectory experienced by these three Asian countries can be explained by the “convergence” phenomenon – the tendency of poor countries to grow faster than rich countries, once they address certain structural and policy factors. The economic logic of this “catch-up” process is straightforward: for countries with lower levels of per capita output, there is a larger gap between current and potential capital stock and technology. That gap can be closed rapidly through the adoption and imitation of existing technologies, which improve productivity, and through high rates of accumulation of physical capital, owing to higher returns on investment. And, indeed, Japan, South Korea, and China all maintained high levels of investment throughout the catch-up process, peaking at nearly 40% of GDP in Japan in the 1970s. South Korea reached similar levels in the 1990s; and China’s investment spending currently stands at more than 45% of GDP. As countries move closer to their potential per capita output levels, the power of convergence diminishes, forcing its beneficiaries to adjust their growth models accordingly. Reducing investment, due to its lower returns, is an important component of that adjustment. Another is increasing technological innovation, to avoid a sharp slowdown in productivity growth. A third is shifting output from low-value-added agricultural and manufacturing goods to higher-value-added domestic services. China, like Japan and South Korea before it, is now pursuing this adjustment. But it faces serious obstacles, beginning with limited institutional and human capabilities – a constraint that could hinder domestic innovation and efficient resource allocation. China also faces diminishing labor input growth, owing to low fertility rates and rapid population aging. According to the United Nations, the average growth rate of the working-age population will be -0.1% in 2010-2020, a sharp decline from 1.5% in 2000-2010. In addition, as employment moves to the services sector, overall productivity growth could fall, as it did in Japan and South Korea. In China, GDP growth per worker in the services sector was only 1.3% in 1981-2010, compared to 15.1% in the manufacturing sector. Of course, China should not be working to restore past rates of GDP growth. That would be a waste of time. As former US Treasury Secretary Lawrence Summers and Harvard University professor Robert Barro have pointed out, a slowdown was inevitable for China, just as it was for Japan and South Korea. My work suggests that China’s GDP growth rate will decline to 5-6% in the coming decade, and 3-4% in the long run. With its catch-up glory days in the past, China should aim for higher incomes through steady growth and lower volatility. To achieve this, it must focus specifically on crisis prevention and management. That is where Japan and South Korea went wrong. In the 1980s, Japan allowed asset bubbles to grow. That may have spurred growth for a while, but when the bubbles burst, the financial system’s huge debts helped push the economy into a bout of deflation and stagnation from which it has still not fully emerged. Similarly, South Korea was thrown into financial crisis in 1997, when panicked foreign investors fled, hitting the over-leveraged corporate sector hard as the air was sucked out of the under-supervised financial system. As it stands, China seems to be moving along a similar path. According to the Bank for International Settlements, Chinese corporate debt has increased rapidly in recent years, from 99% of GDP in 2008 to 166% in 2015, with more than half of the debt owed by poorly performing state-owned enterprises (SOEs). This does not bode well for the corporate sector or the financial system. But it is not too late to change course. To avert a crisis, China’s leaders must act now to address the weaknesses in the corporate and financial sectors and to improve macroeconomic- and financial-policy frameworks. To keep productivity – and incomes – rising, they must continue to implement structural reforms that support labor-market flexibility and the development of human capital, while privatizing SOEs and liberalizing the financial sector. Like its neighbors, China will have to confront slower growth, and its social consequences, head-on. But the country’s future is anything but predetermined. With the right approach, it can manage a smooth transition from middle- to high-income status – a transition that would not only improve the wellbeing of China’s 1.3 billion citizens, but also reduce risks and uncertainties in the global economy.